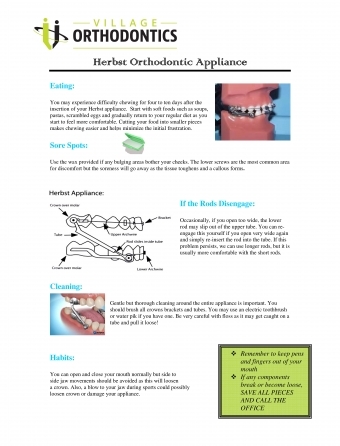 Herbst Orthodontic Appliance - all you need to know! 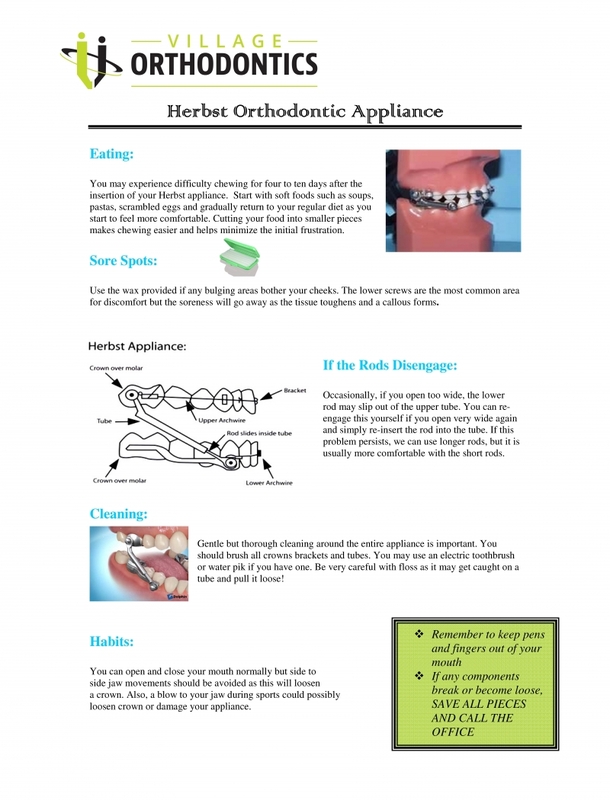 You may experience difficulty chewing for four to ten days after the insertion of your Herbst appliance. Start with soft foods such as soups, pastas, scrambled eggs and gradually return to your regular diet as you start to feel more comfortable. Cutting your food into smaller pieces makes chewing easier and helps minimize the initial frustration. Occasionally, if you open too wide, the lower rod may slip out of the upper tube. You can reengage this yourself if you open very wide again and simply re-insert the rod into the tube. If this problem persists, we can use longer rods, but it is usually more comfortable with the short rods. Gentle but thorough cleaning around the entire appliance is important. You should brush all crowns brackets and tubes. You may use an electric toothbrush or water pik if you have one. Be very careful with floss as it may get caught on a tube and pull it loose!